As you recall from my previous posts I am doing greeting cards for the challenge that Kristin is holding over at Twinkle Twinkle called the Colour of Summer. Week 2 is the colour Green. Wow my favourite colour and I had no trouble finding green in my stash. When I buy paper I always tend to go towards greens so this was no problem for me. In the challenge for an extra added bonus we were to add the colour citron also so when digging through my papers I found this wonderful cardstock that had both shades I was wanting to use. How cool is that? I found a die cut that I had previosly cut for another project and never used so here is Tim design painted in 3 various shades of slip slap green with a bit of citron dabbled here and there. If you click on the card you can see a larger version and all the colours of the houses. I also added some interest to the windows. I cut small various colours of cardstock with green in it and put them behind the house windows and edged all the windows in gold metallic pen. 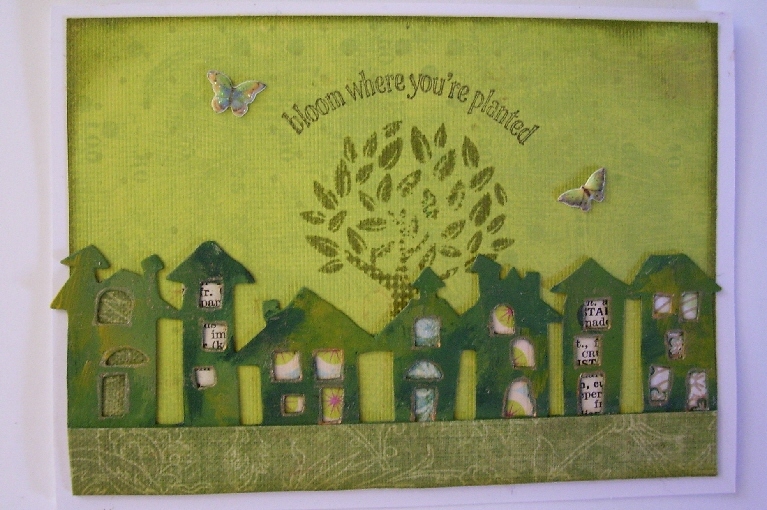 The border below the houses is also a green border and I also inked the edge of the cardstock in Peeled Paint distress ink. How green is that? I found a tree that I liked with a nice verse, Bloom where you are planted and stamped that as well in Peeled Paint. Last but not least I found some K and Company little butterflies with a bit of Green and Citron and applied them as well. This card will go in my stash for a cheer you up or new home or to just say hello card. Not sure yet but it will find a good home sooner or later. Check out all the great art work and interpretations of the Colour of Summer. Click on the link in my sidebar or the above link provided. It's not to late to join in and there are prizes too. Thanks for dropping by and stay tuned for some doodling I have been doing. Smashing card Lesley, loving all the greens and the diecut looks terrific. That's gorgeous, Les! I love it! Oh Les.. what a beautiful card.. I knew you would be in your element this week with the colour green! I love how you have used co-ordinating cardstock behind the windows. It would make a fab 'new home' card. So much thought and detail in this. Just adorable! I love this card the little houses are too cute. This is sooo cute, with the little houses! I love it! What a sweet card! I just love the saying - and it goes perfect with the card. I am sure who ever receives it will love it! Love this card and all the different papers in the windows! Thanks for stopping by! I still need to make my green piece..hopefully soon, lol! I love little houses! This is a wonderful card! I love the little houses!